Want to stay cool this summer? 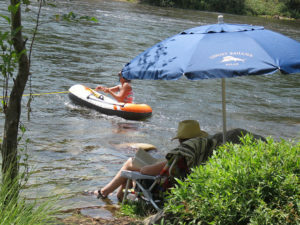 The cold water of the South Fork of the American Riwhitewater-raftingver is the perfect antidote to the summer heat. There are too many rafting companies to list here. TheAmericanRiver.com has a good list to help you find your perfect ride down the river. If this is too scary for you, grab a beach chair, find a shade tree and park it at the edge of the river. tip: put the chair in the river so your feet are in the cool water and the rest of you is dry. Sit back and watch the river flow and rafters float by. Riverside parks with day access include: Henningsen-Lotus-Park – The Coloma Resort sells day use passes. They have a great view of rafts plunging into “Troublemaker” a class 4 rapid. Get there before noon to see the most rafters. Sunday is you best bet for a quiet campsite by the water after the weekend group checks out.